Nearly a week has passed since a tragic Oakland warehouse fire killed 36 people, but the community continues to struggle with the aftershocks. Bob Lapine flew into Oakland from Utah to see the now-ravaged site of the three-alarm blaze where his 34-year-old son Edmond Lapine died. He said his son worked in a bakery but was most passionate about music and being a DJ. 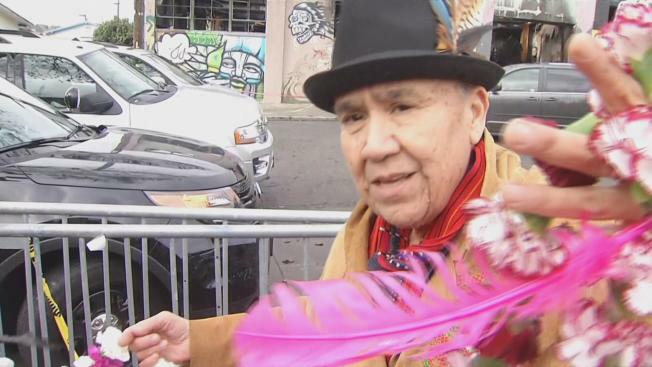 Friends and family members continue to flock to the so-called Ghost Ship warehouse at 1315 31st Avenue, where an electronic music party was in full swing when the fire sparked. About 20 artists who belong to a collective called Satya Yuga also lived in the building, which city officials have said was only permitted for use as a warehouse. Photographer Bob Lapine flew in from Utah to take pictures the Ghost Ship warehouse, where his son, Edmond Lapine, 34, died. “There’s a lot of things I wish I had said to him. It’s just tough,” he said. A group of artists on Friday placed a handmade lei, and spread lavender and sage by the charred Fruitvale structure in honor of the victims. “It’s to honor their journey and loss of their lives,” Vaschelle Andre explained. The women said they didn’t know any of the victims, but as Bay Area artists feel connected to them. For Lorena and Luis Dominguez, the impact is more than emotional. “We can't stop thinking about the victims lost, their families,” Lorena Dominguez said. The couple owns a cell phone shop as well as a clothing and shoe store just a few doors down from the warehouse. As of Friday, they still don't have power and all their merchandise is either smoky or wet from the fire and the water used to put it out.